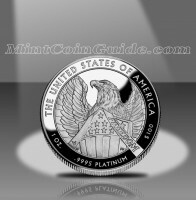 The 2007 American Platinum Eagle Coins saw mintages drop again in the bullion and proof ranks, but did realize some increases in the number of uncirculated Platinum Eagle sold. Unfortunately, the platinum market was not conducive during the year for strong Eagle sales. The precious metal once again rose from the previous year and ended up at an average of $1,303.05 an ounce. This was an increase of $160.74 an ounce. One ray of sunshine in the mintage numbers were the Uncirculated Platinum Eagles. Available for a larger percentage of the year than they were in 2006, the number of these strikes sold improved across the board. 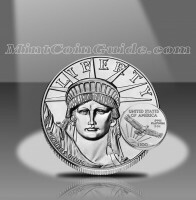 Despite an increase of over 1,200 One Ounce Eagles and over 2,000 1/10 Ounce Eagles, the total bullion mintage still fell during the year owing to extremely poor numbers shown by the 1/2 Ounce and 1/4 Ounce strikes. Proof Eagle Mintage also dropped in 2007 owing mainly to the large drops seen in the number of fractional proofs sold. The chart below shows the total mintage of 2007-dated Proof Platinum Eagles which includes the number sold as part of the Proof Platinum Eagle 4-Coin Set (of which 4,595 were sold). After having only been available a few months in the previous year, the mintage for the 2007 Uncirculated Eagles was easily able to surpass the debut year mintage. The chart below shows the total mintage of 2007-dated Uncirculated Platinum Eagles which includes the number sold as part of the Uncirculated Platinum Eagle 4-Coin Set (of which 2,486 were sold). The 2007 Platinum Eagles marked the eleventh year in which the US Mint produced the platinum strikes. 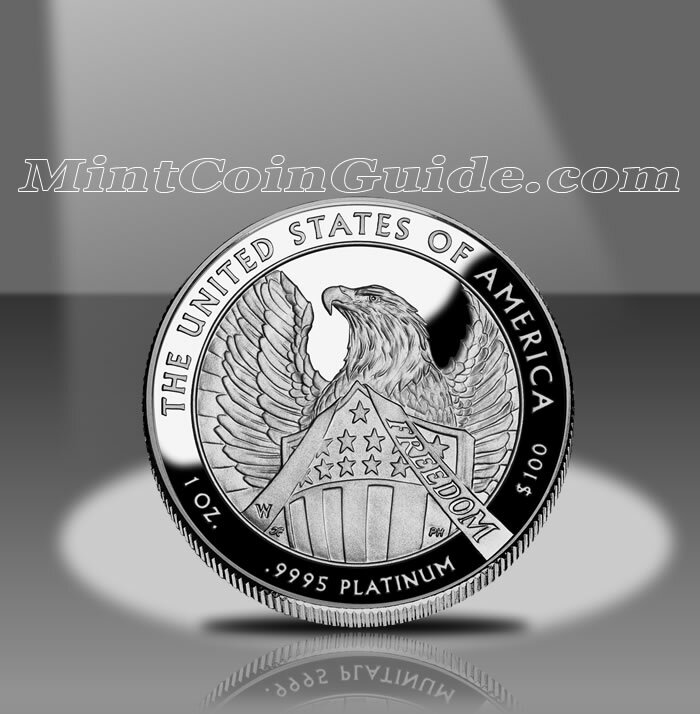 The US Mint released the collectible proof and uncirculated Platinum Eagles on July 17, 2007. The bullion Eagles were available for most of the year from the US Mint’s network of authorized purchasers. Once again, the Mint was forced to increase the price it charged for the Platinum Eagles owing to the increased cost of the precious metal. As such, the Mint charged $1,599.95 for the One Ounce Proof, $809.95 for the 1/2 Ounce Proof, $439.95 for the 1/4 Ounce Proof, $229.95 for the 1/10 Ounce Proof and $2,949.95 for the 4-Coin Set. Bullion Eagles were sold by the Mint’s network of authorized purchasers for a small premium above the spot price of the platinum they contained. The Uncirculated Platinum Eagles sold for $1,489.95 for the One Ounce Uncirculated, $759.95 for the 1/2 Ounce Uncirculated, $399.95 for the 1/4 Ounce Uncirculated, $189.95 for the 1/10 Ounce Uncirculated and $2,769.95 for the Uncirculated 4-Coin Set. Designed by United States Mint Artistic Infusion Master Designer Thomas Cleveland and engraved by United States Mint Sculptor-Engraver Phebe Hemphill, the reverse of the proof and uncirculated Platinum Eagles is the second of three annual designs representing the "Foundations of American Democracy." This design shows a bald eagle with its wing’s spread wide to represent freedom. A ‘W’ mintmark on each proof and uncirculated Eagle indicates it was struck at the US Mint’s facility in West Point. "Portrait of Liberty" is featured on the obverse (heads side) of all of the Platinum Eagles and was designed by John Mercanti. The reverse (tails side) of the bullion Eagles still shows Thomas D. Rogers Sr.’s soaring eagle as they have done since their debut. The proof and uncirculated reverse has a bald eagle design as done by Thomas Cleveland.